Launch an exciting career in law and make a name for yourself in corporate, community or government legal sectors. If you’d like a dynamic and fulfilling job in law, learn from the best at VU. retired High Court Judge, the Hon. Michael Kirby. relevant legal professional computing skills. Thanks to our partnerships with the courts and community legal services, you’ll also gain practical, real-world experience of the justice system – helping you along the path to a rewarding career in law. We also offer Honours in Law for our high academic achievers. Our partnerships with industry mean you’ll learn from experienced professionals in the legal sector – working on cases that have a real impact on people. At VU, we make sure you graduate with plenty of practical experience under your belt. That’s why we encourage students to take advantage of our renowned moot program. A moot court is a mock court which simulates the proceedings of a live court room. By participating, you’ll develop your legal skills and be work-ready to practise law in the real world. Our Queen Street campus is located in the heart of Melbourne's legal district. computer labs, seminar rooms, lecture theatres, student lounges, study spaces and a prayer room. When you graduate from a Bachelor of Laws at Victoria University, you’ll be in high demand because we’ll make sure you’re job-ready. You could work as a lawyer or in legal practice in areas including criminal law, family law, commercial law and business. Many of our graduates choose to work in community legal centres providing legal access to disadvantaged groups, and in not-for-profit organisations. Industries in Melbourne with the greatest demand for law graduates are banking and finance, corporate/commercial, litigation, private equity, projects, property, tax and workplace relations (Graduate Careers Australia). Four months after graduation, the average salary of Bachelor of Law graduates is A$53,000 (GradStats). 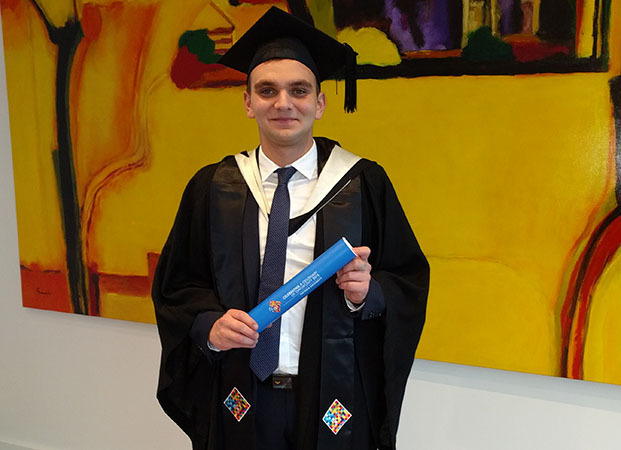 Ante Sentić didn't believe he would ever practise law, but he made the most of his chance and has already been recognised at various levels for his achievements. Students who enrolled in the Bachelor of Laws prior to 31 Dec 2014 may apply to undertake the unit Advanced Legal Research Dissertation in their later years in this degree based on the aggregate of points attributed to the top two thirds of units so listed shall then be calculated and a grade point average determined. Students will be further assessed on an outline of a proposed thesis topic and availability of a college based or college affiliated supervisor. Students will be awarded a Bachelor of Laws with Honours (Class H1, H2A, H2B or H3) based on their aggregate of points and overall mark in Advanced Legal Research Dissertation. Students in any Bachelor of Laws course may apply to transfer into any Bachelor of Laws (Honours) course if the selection criteria is met. 8. Contribute effectively, with personal accountability for outcomes in a dynamic 21st century work team, working in an ethical and socially responsible manner. Completion of an Australian Senior Secondary Certificate (VCE or equivalent) including Units 3 and 4: a study score of at least 30 in English (EAL) or 25 in any other English. A study score of 35 in English (EAL) equals 5 aggregate points. A study score of 30 in English other than EAL, any History, Legal Studies, Australian Politics, Global Politics or Psychology equals 5 aggregate points per study. Overall maximum of 20 points. Units 3 and 4: a study score of at least 30 in English (EAL) or 25 in any other English (or equivalent). All applicants are encouraged to complete the law supplementary form which may be used to adjust an applicant’s Selection Rank. Students in any Bachelor of Laws may apply to transfer into the Bachelor of Laws (Honours) degree once they have completed a minimum 192 credit points and have attained an average mark of Distinction or above i.e. 70–100%. Applicants will be assessed on the highest grades achieved in the top 12 Law units. Students will be further assessed on an outline of a proposed thesis topic and availability of a college based or college affiliated supervisor. Successful applicants will enrol in both Advanced Research Legal Methods and Advanced Legal Research Dissertation instead of 24 credit points of law electives. You will be credited for up to 120 credit points of study.